TwinsFest begins Friday and runs through Sunday, and the event has a new home this year -- Target Field. Several current and former Twins players, including Joe Mauer, are expected to be in attendance. MINNEAPOLIS — The demise of the Metrodome means a new location for the long-running TwinsFest. In need of an indoor space to host the event, the Minnesota Twins explored several options but ultimately decided on having this year’s TwinsFest at Target Field. Since few fans would want to stand outside in the cold this weekend, the Twins will confine the entire event to the indoor spaces of the four-year-old outdoor ballpark. "It just means that we have to be smart about how we lay it out," said Twins president Dave St. Peter. "Ultimately, we try to maximize every nook and cranny. But it also ultimately results in fewer overall tickets being sold. There will be more demand and more urgency, I expect." TwinsFest begins Friday and runs through Sunday. On Friday, TwinsFest runs from 4-9:30 p.m. On Saturday, the event lasts from 9 a.m. to 6 p.m., and on Sunday the three-day festival wraps up from 9 a.m. to 4 p.m. St. Peter said the tickets for Saturday are already sold out, and he expected either or both of the other days could follow suit. In years past, the event has included a wide array of events and opportunities for fans. Among the highlights every year are autograph sessions with Twins players. This year will be no different, as St. Peter said more than 70 current, former and future players will be in attendance. That includes two of baseball’s best prospects, outfielder Byron Buxton and third baseman Miguel Sano, who will surely be among the most sought-after autographs this weekend. 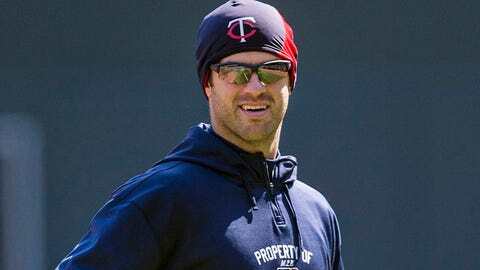 Newcomers Ricky Nolasco, Phil Hughes and Kurt Suzuki are all scheduled to be at Target Field for the event, as are mainstays like Joe Mauer and manager Ron Gardenhire. This year, however, the players’ contributions to TwinsFest will be more than just signing autographs and taking pictures with fans. St. Peter said the team added several interactive features during which fans will have even more chances to connect with their favorite players. That includes a bubble-gum blowing contest where kids can compete against the Twins; a bingo game called by the players; and a "Fan Feud" that pits fans and players against each other to guess answers to survey questions, a la the game show "Family Feud." "We’ve really worked hard to try to provide an incremental layer of player access," St. Peter said. "One of the things I think fans will notice is beyond autographs and photos, there will be a host of different activities where fans — and specifically, kids — will have the opportunity to meet players, interact with players and hopefully that’ll help create a pretty robust experience." Hosting the event at Target Field means the Twins can take advantage of some of the ballpark’s features and let fans in on the fun. Those attending this year’s TwinsFest will have the opportunity to take their swings in the batting cages as well as tour the Twins’ clubhouse. Also new to this year’s TwinsFest is a yard sale, during which fans can purchase memorabilia, game-used gear or autographs. Just like tickets for the event, proceeds will benefit the Twins Community Fund. "We’ve collected a lot of items over the years," St. Peter said. "The average family has a garage sale. We’re going to have a yard sale. There’s going to be some unique items. It might be jerseys, it might be hats, it might be artwork, it might be publications. There’s a lot of different things that are going to be available." This won’t be the first time TwinsFest has been held away from the Metrodome. When the Dome’s roof collapsed several years ago, the event was moved to the National Sports Center in Blaine. It was also held at the Mall of America. While St. Peter and the Twins’ front office remain confident about the new venue, there could certainly be some wrinkles to be ironed out after the first year at Target Field. "Frankly, it’s like any first-time event. There are aspects where we’re really unsure of," St. Peter said. "We’re trying some new things, trying to make it as interactive as possible with our players. At the end of the day, we’ll be a lot smarter in Year 2 than we will be here in Year 1."